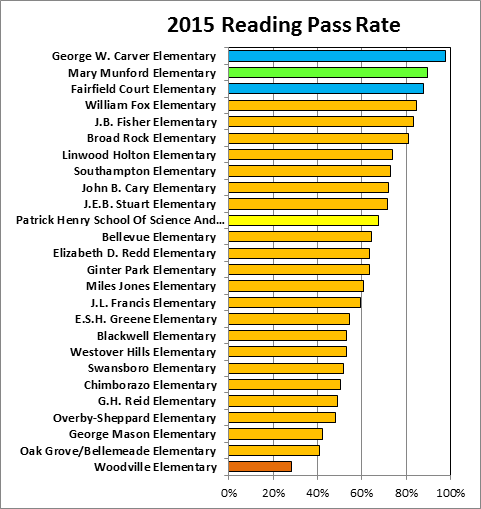 As a further look at the performance and underperformance of Richmond’s elementary schools, here is the range of 2015 pass rates on the reading tests. Here we see Carver and Fairfield Court outperforming (we’ll deal with Munford below) while Woodville underperforms at an unconscionable level. In the meantime, the charter school, Patrick Henry, is in the middle of the pack. 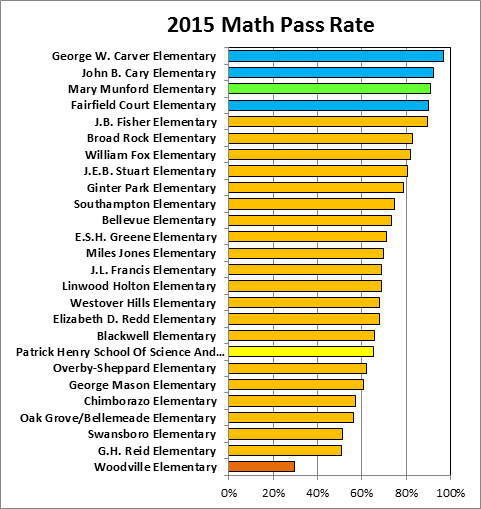 The math scores paint a similar picture except that Cary joins the outperformers and Patrick Henry sinks to the bottom third. 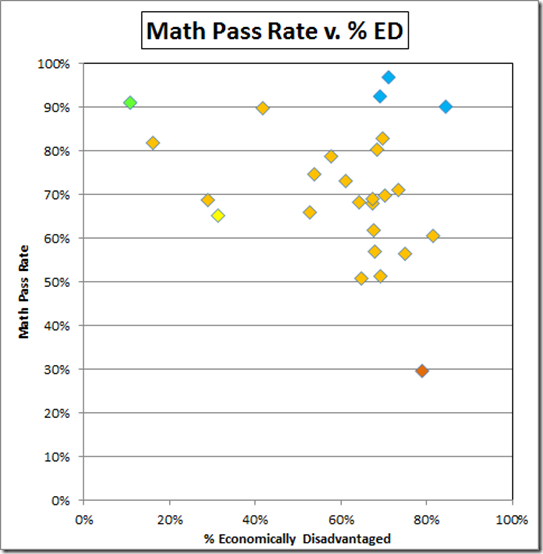 The Fall membership data from VDOE tell us that Munford, the green point, is blessed with a large population of more affluent kids while the other leaders, blue with Carver to the left, are not. Woodville, with 79% economically disadvantaged students, is the orange point. 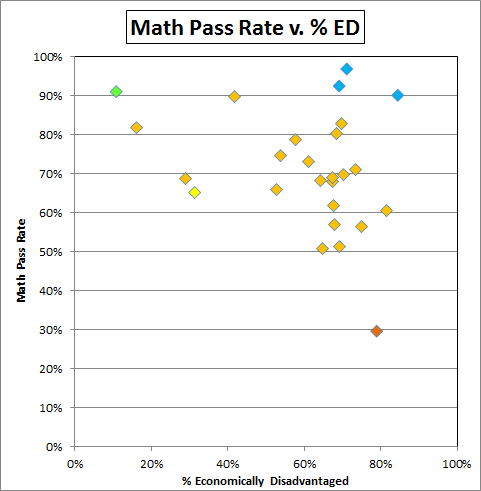 Here is the same graph for the math tests. Cary joins the leaders as the left-hand blue point. 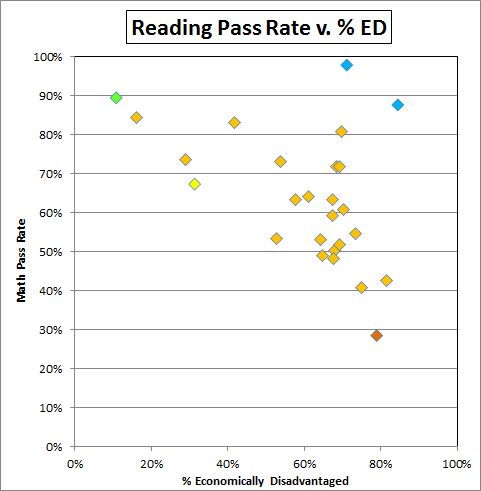 For sure, the economic status of the students does not explain these data. Where is VDOE? 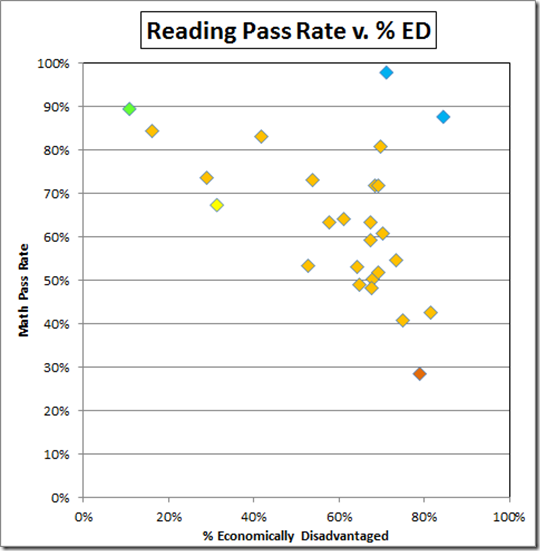 Where is their study that explains the over- and under- and mediocre-performance of these schools? What are they doing to transmit that information to the other schools? 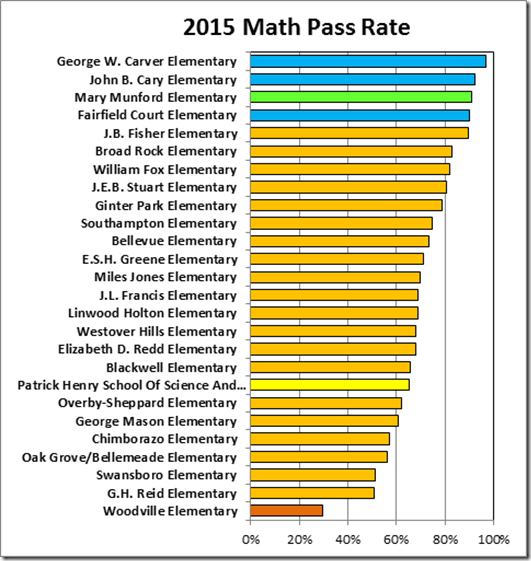 Carver and Fairfield and Cary (in math) are doing something right (or cheating extravagantly); what is it and why are the other schools not doing it? 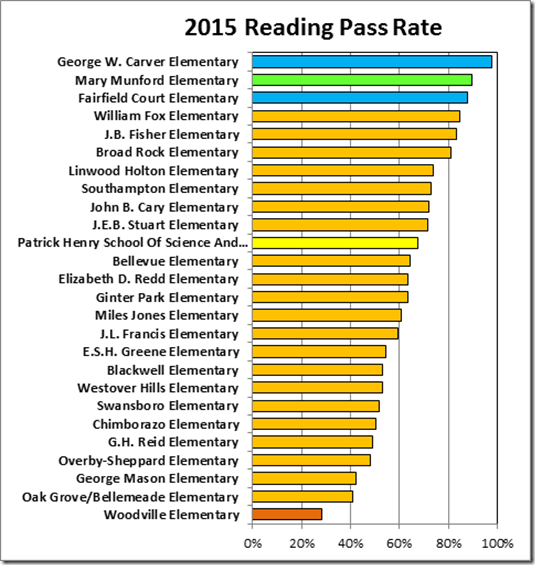 Patrick Henry has absorbed a lot of money and energy but is not getting results. What is wrong there? Where are the Woodville parents? Why are they not at the School Board every meeting to demand that RPS stop abusing their kids? Where is VCU? To date, their major “contributions” have been a study to validate the VGLA that, upon examination, is a whitewash and the hiring of Richmond’s failed Superintendent as an Associate Professor in “Educational Leadership.” Perhaps they could do something constructive for a change.